decreased 0.3 per cent compared to September 2017, and increased 11.8 per cent compared to October 2016.
compared to September 2017, and increased 18.4 per cent compared to October 2016. 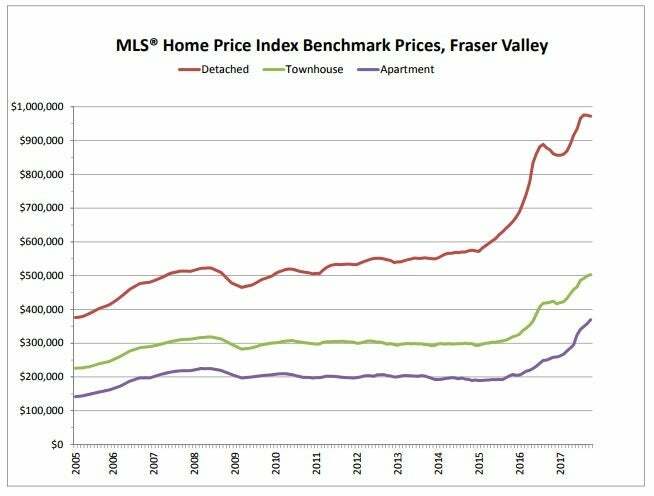 • Apartments: At $369,400, the Benchmark price for apartments/condos in the Fraser Valley increased 3.1 percent compared to September 2017, and increased 36.4 per cent compared to October 2016. The Fraser Valley Real Estate Board is an association of 3,514 real estate professionals who live and work in the BC communities of North Delta, Surrey, White Rock, Langley, Abbotsford, and Mission.